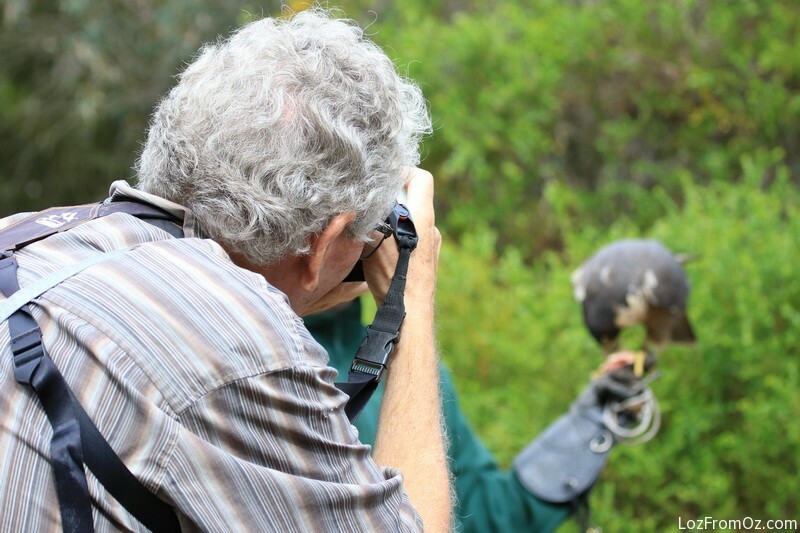 Feathers and eyes – our arrival at Raptor Domain sees me full of anticipation to use my ‘bird mode’ programmed setting on the Canon. The eagles in Kenya were the starting point and now I understand what to do a little better I am ready and rearin’ to go! Through the incredible gate pictured above we proceed to the waiting area where there is a souvenir shop and small cafe. There is a lot of information on the walls about the birds and reptiles that inhabit these areas and then with cameras and gear we head to the seating area inside. This will be the general public part of the show and it is very well done especially for the ankle biters in the audience. Some of them are glad to hold the birds and some are a bit on the timid side. It’s great to see the kids enjoying themselves and also learn something along the way – hopefully. Most of the birds in the presentation have been injured or orphaned and are not suitable for release. I am glad that there are people who care enough to keep them safe. 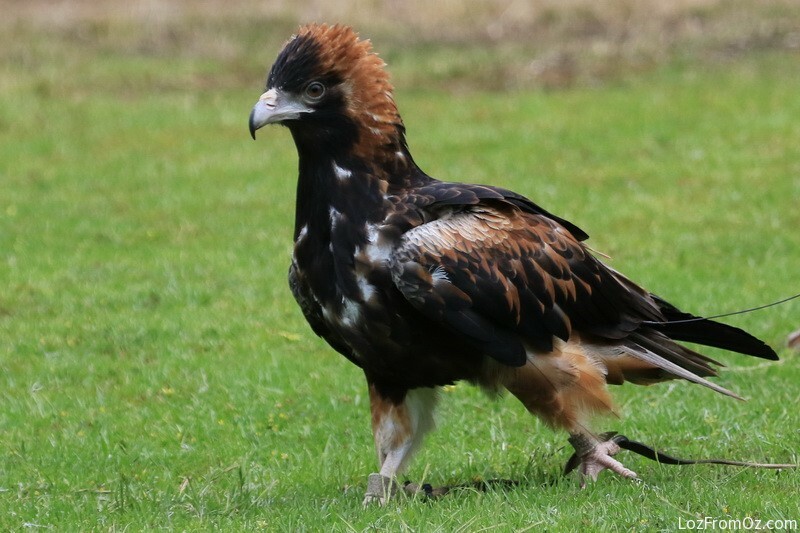 I will put a short description of the birds (thanks to the Raptor Domain website). Pictured right is Hobbit the Hobby falcon. 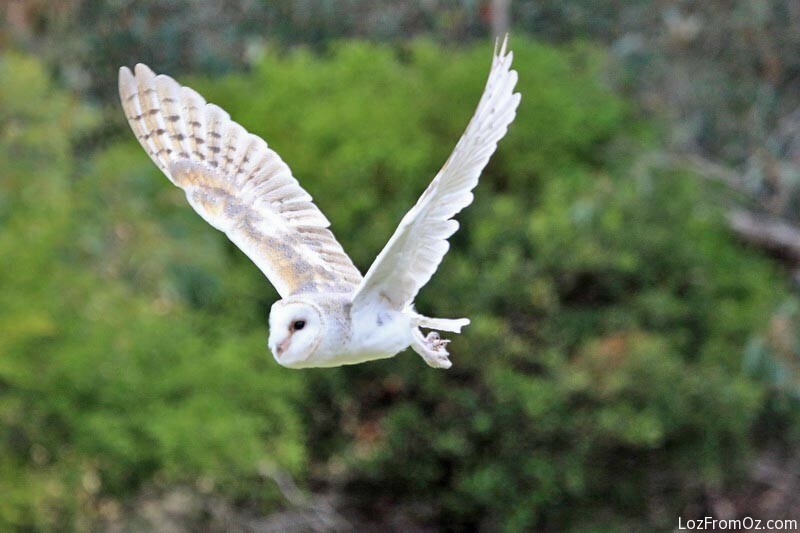 Her wing was injured after flying into a power line when she was young and in-experienced. Unfortunately her wing never healed enough for her to be returned to the wild. 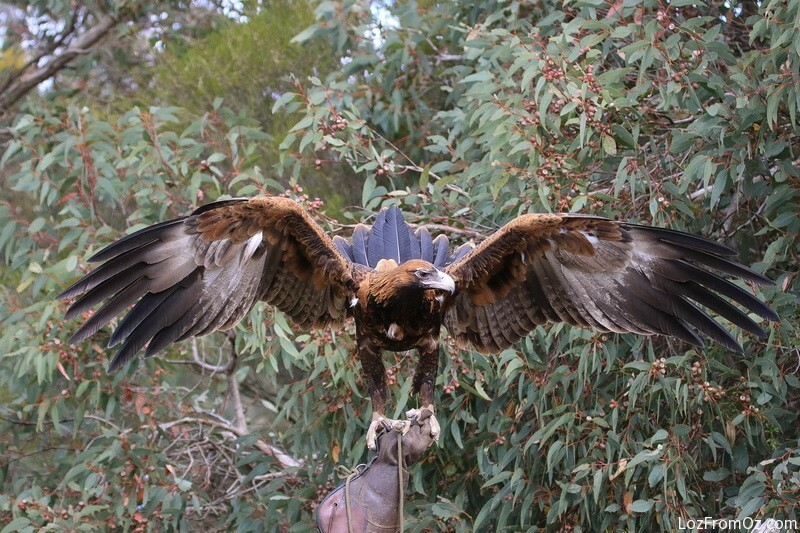 She was rescued in South Australia which was good for her as in most other states if a bird can’t be returned back to the wild they are euthanized. She flies each day in the displays and is the most gentle, smart and sweetest bird in the whole collection. Above is Slim the Black Breasted Buzzard and from the way he struts around I bet he knows how good looking he is. He was bred in captivity from the only captive breeding pair in the world and he loves to attack emu eggs to get a good feed. These two and the next two are not part of our private showing. 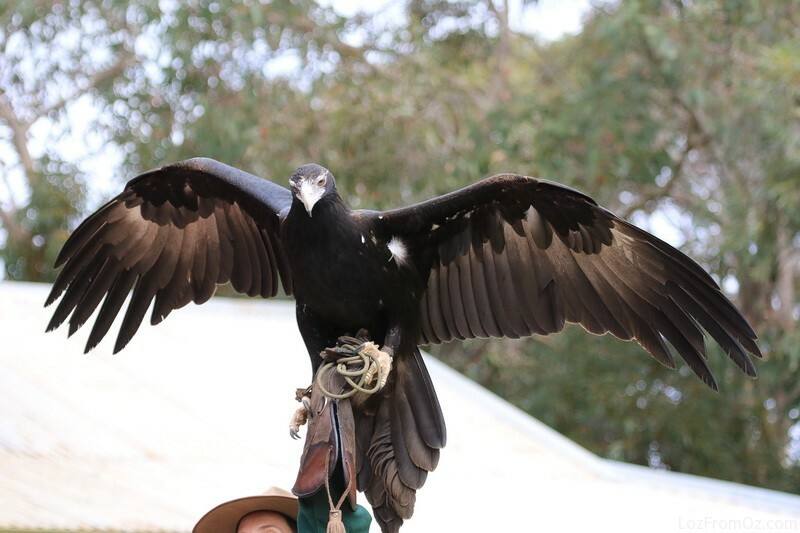 Jedda the Wedge Tailed Eagle has been with the owner Dave since 1992. 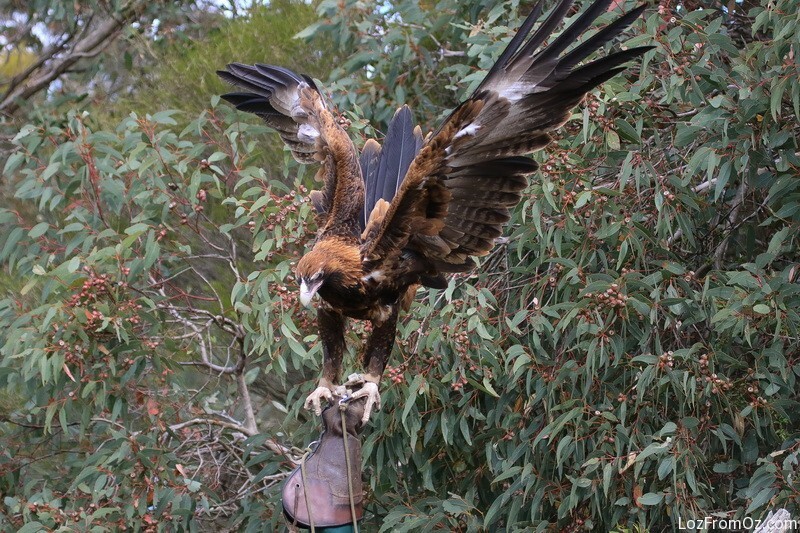 She was orphaned when she first came to the Territory Wildlife Park where Dave was working at the Birds of Prey section and they have been together ever since. When Dave left the TWP Jedda had to go too, as no-one else could handle her. All attempts to release Jedda failed because Jedda didn’t want to leave Dave. Now that is true devotion. 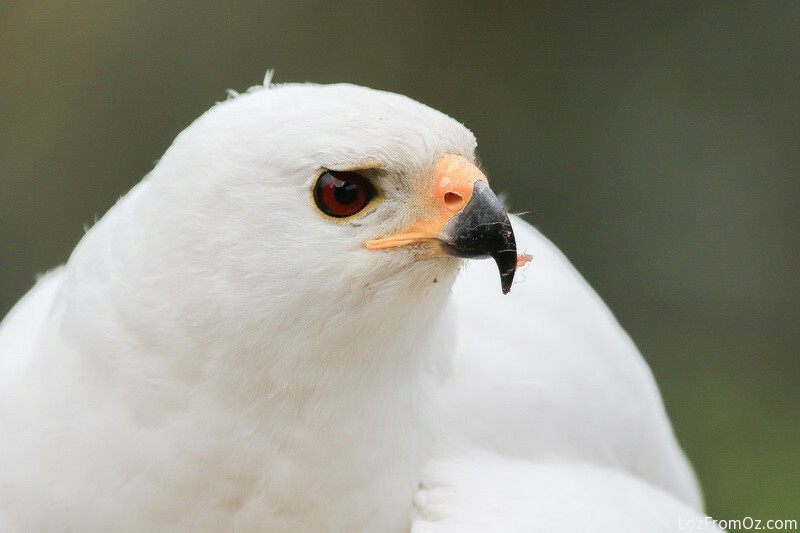 Pearl the White Goshawk – oh so snowy white. 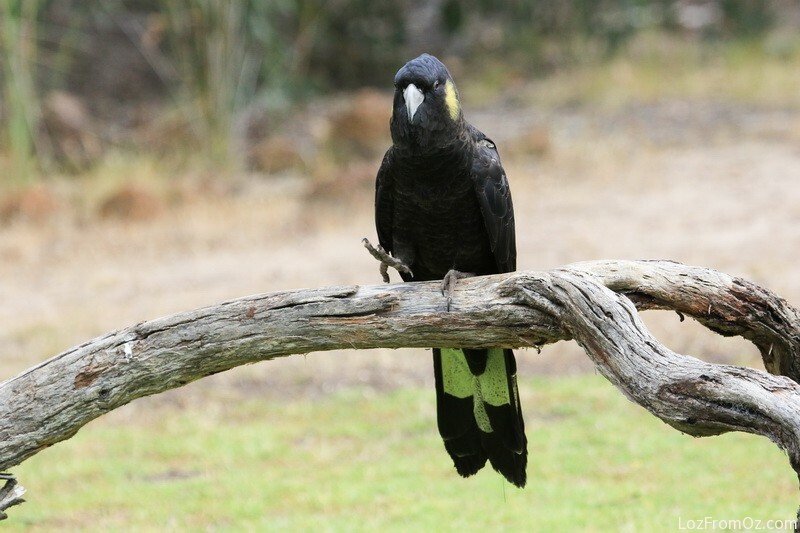 Bred in captivity at Featherdale Wildlife Park, her parents are the only captive breeding pair in the world. What a pretty girl she is and even though she is glad to fly around and show off, I think she just likes to stay still and have lots of photos taken. Once the show is over and the general public have left we remain for our private viewing – how exciting.. Over the next hour or so all you can hear is the cameras clicking like machine guns as the birds fly around on a well rehearsed flight schedule. Hopefully from the amount of photos taken everyone will have some good shots. Mine total around 700 with 230 making the final cut to my screensaver. 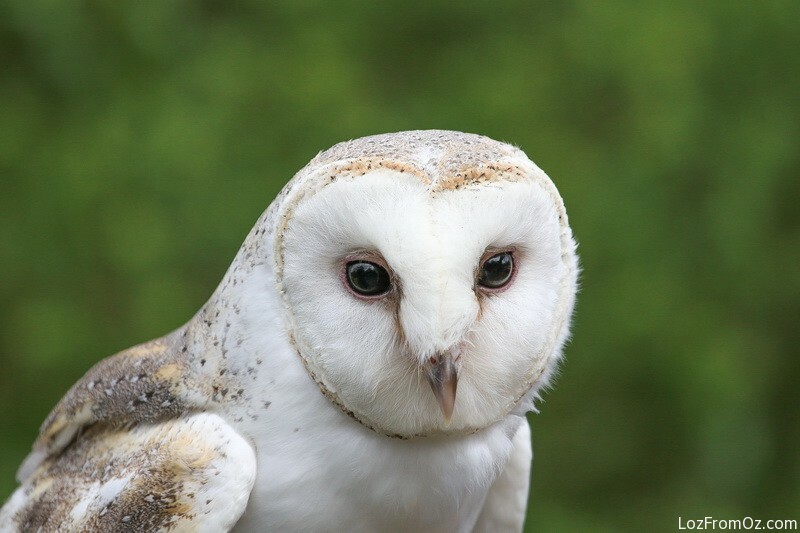 First up is Casper the Barn Owl (below left) who loves people and enjoys a friendly pat as he sits on the knees of the audience. He enjoys flying around and showing off for us and has a very cute face. 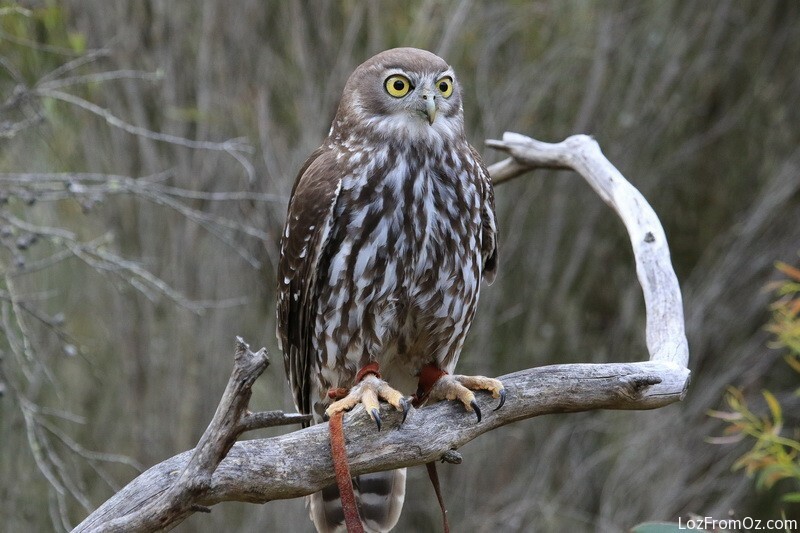 The next one could very well be my favourite – Ellie the Barking Owl. Ellie is a female Barking Owl that was aviary bred and arrived at RD from Western Australia as a chick. She has big beautiful yellow eyes and has her own souvenir line called ‘I Only Have Eyes For You’. I just love the way she looks at you with those eyes – she lines you up and then heads toward you as if you are on the menu. They are very mesmer ‘eyes’ ing to say the least. 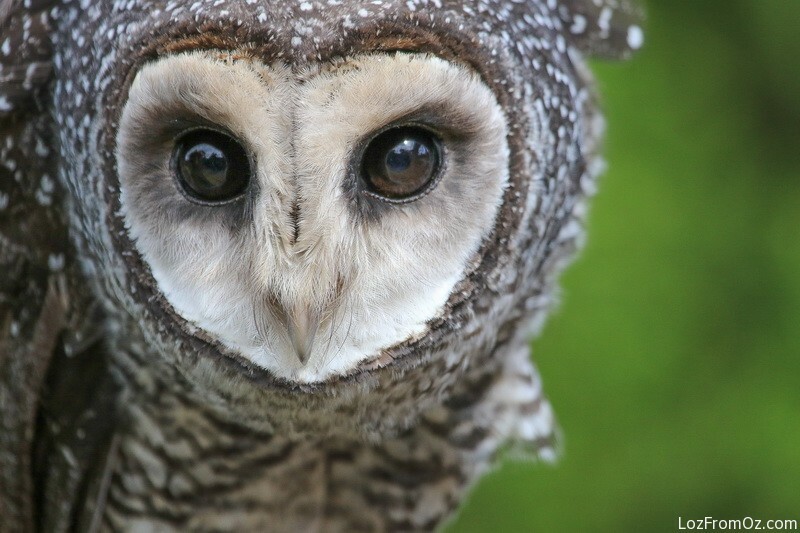 Owls are the most engaging birds especially when they look at you with those beautiful big eyes – so I am excited when the next object of our lenses is Omen the Sooty Owl. 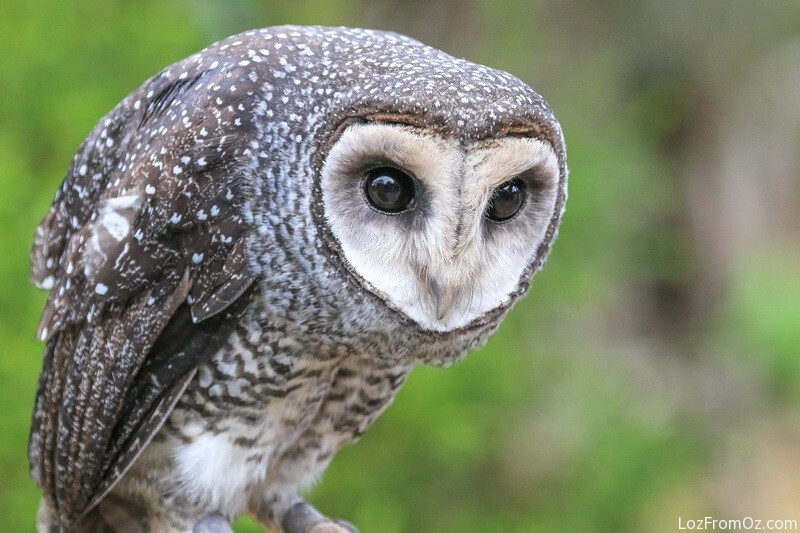 Bred in captivity, this owl was hand-raised here at Raptor Domain. What an amazing looking bird and it is great to get up close and personal with such a rarely seen bird – I have never seen one before, have you? A little rest for a while and then we are swooped upon by some Yellow Tailed Black Cockatoos. 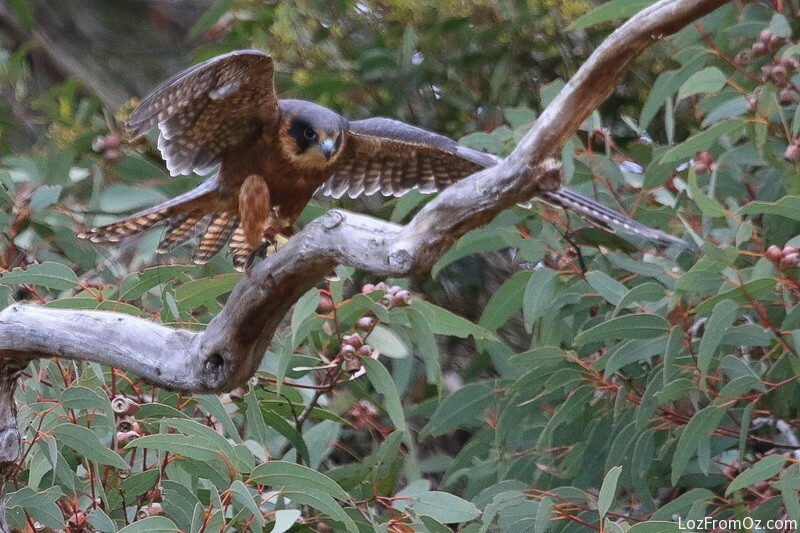 We are so lucky here in OZ to have some of the most magnificent birds in the world. These startlers just fly out from behind the bushes and even though we are given a bit of a warning that they are on their way it is still pretty difficult to get them focused just right. 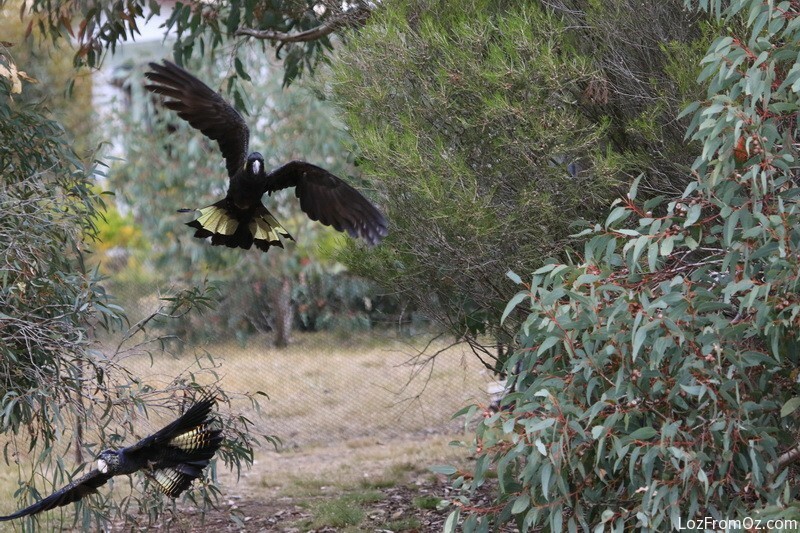 A few squawks later and some impressive flybys and they are on their way back home. Time for us to have a bit of a break and a wander around before the next lot of feathered friends are ready. Missy the Peregrine Falcon is another pretty one. 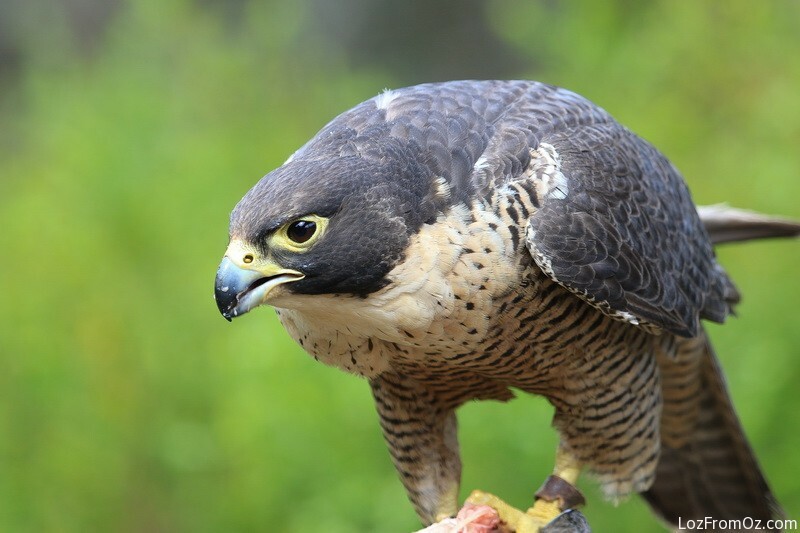 Peregrine Falcons live in several of our major cities, nesting on the ledges of skyscrapers. They can often be seen soaring above busy city streets, and their harsh chattering calls may be heard by passersby a hundred metres below. 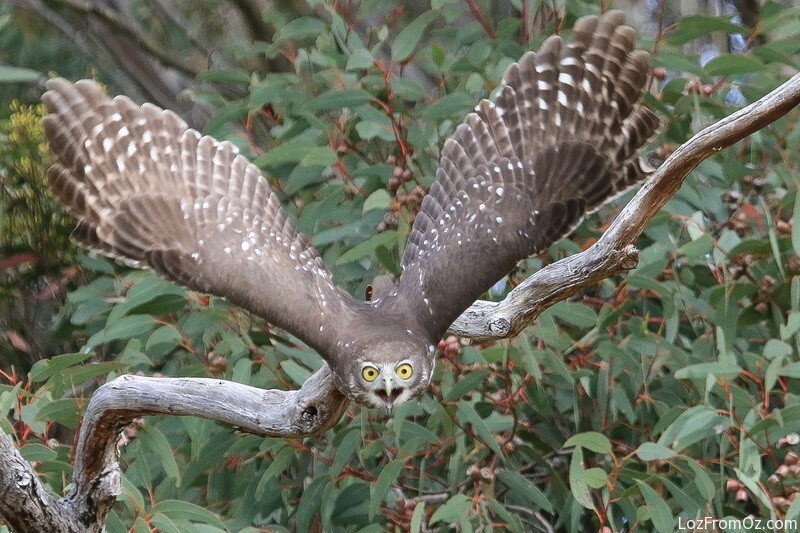 They swoop onto their prey at speeds of up to 300 km/h, which has inherent dangers, as they occasionally collide with overhead wires, usually fatal at such speeds. Missy does not have to worry about that as she lives here in such a safe and wonderful place. 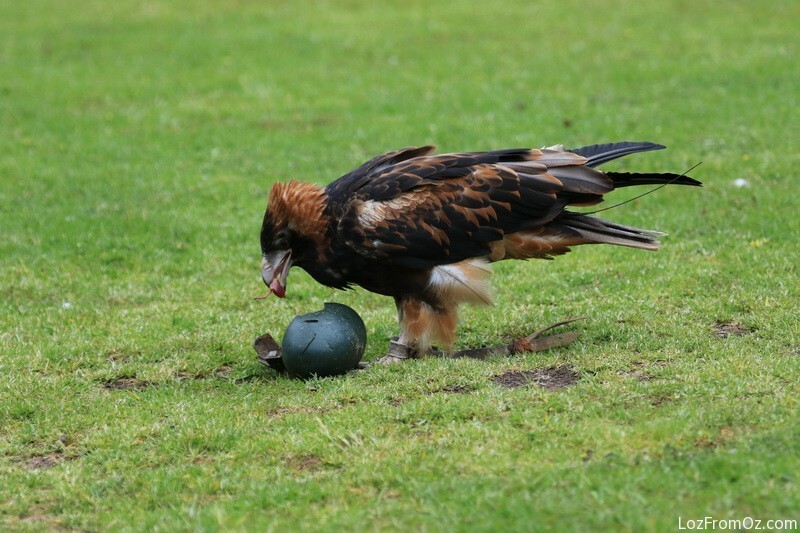 Tilka is a juvenile Wedge-tailed Eagle and was rescued near Broken Hill by the local wildlife rescue group. She was heat stressed, dehydrated and near death. Tilka has recovered nicely and now flies in the displays, and just like all the other birds at Raptor Domain is a wonderful ambassador for her species. Such a magnificent bird, it really is a privilege to be up so close and personal with her. 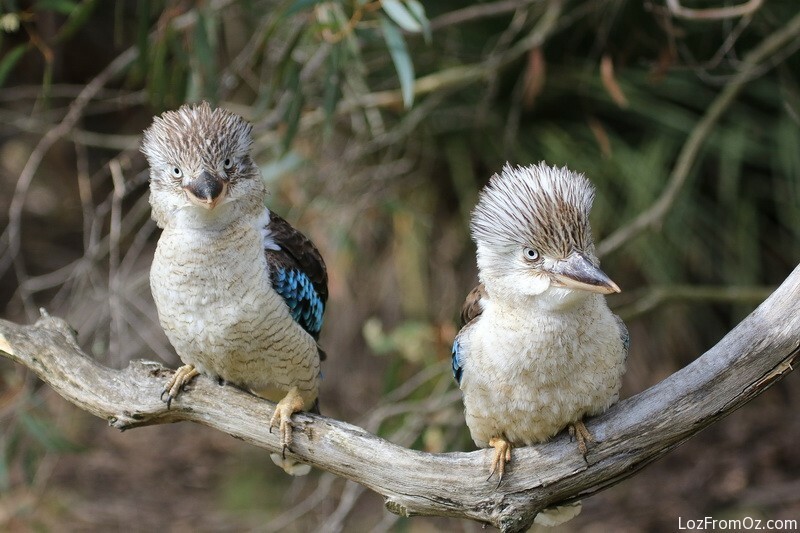 To finish off the show we have two blue winged Kookaburras – Mike and Mal. Remember the Leyland Brothers – Mike and Mal? If you are nearly as old as me you will remember them travelling across Australia showing us just how beautiful our country is. For those of you who deny being that old or if age has taken your memory just click here. 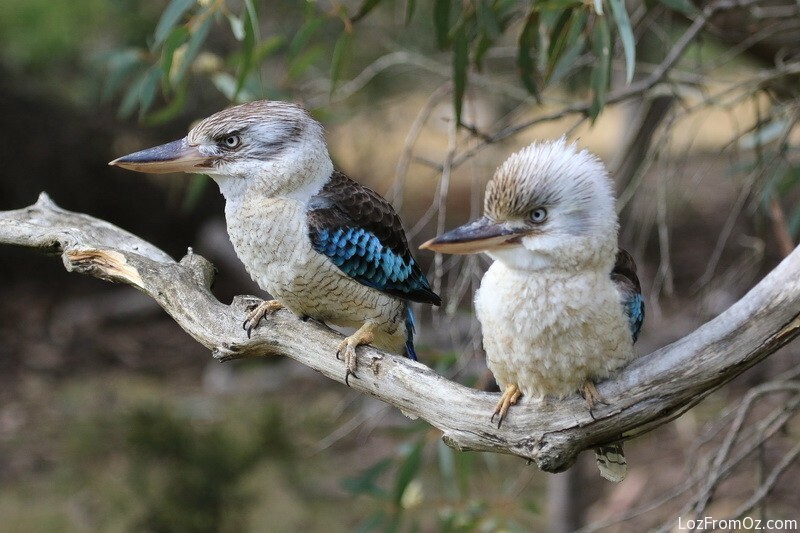 Kookaburras are a species of Kingfisher found across Northern Australia. So what are they doing in the South? I don’t know. I think they look wonderful with their feathers raised on their heads. Apparently they think it makes them look bigger if they feel threatened. I think it makes them look as if they have been goosed! So after many, many, many photos taken and much enjoyment in watching the birds fly around and endearing themselves to us it is time to bid farewell and head off to Seal Bay for our private session with the Seals. So here I am all prepared to take the shot and lo and behold a photo bomber. Really? Do you not have eyes? Can you not see me standing here? Do you just have to prance right in front of me? Goose! Time to take a deep breath and press on!